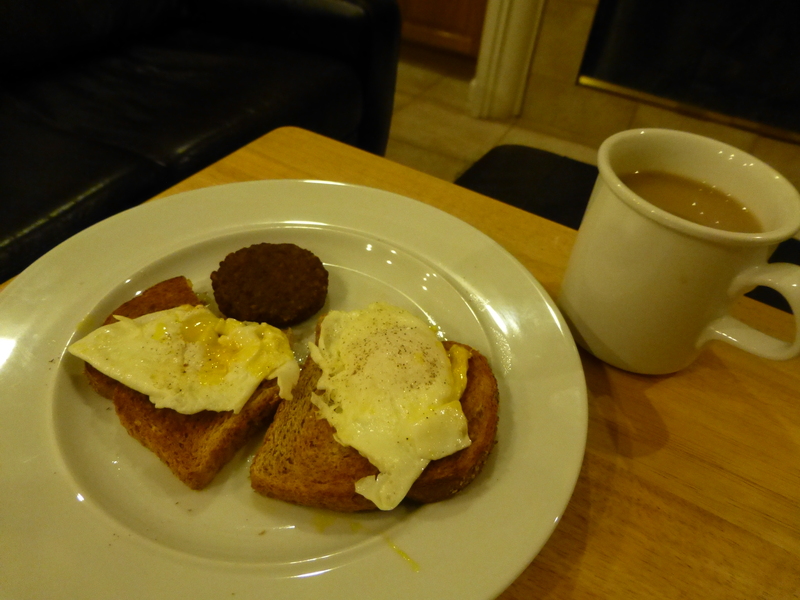 January 9, 2015 – Breakfast for dinner! Today I eat two breakfasts, one at the appropriate time and one for dinner. John goes into his office today and I am going out to lunch and then later we will slog home through the heavy commute traffic. I know I will not feel like going to a lot of trouble at dinner. Breakfast for dinner seems an easy solution. My first breakfast is ham and chez on an English muffin. I’ve already had ham and chez once this week so this time I put it on an English muffin instead of sandwich round. At least it is a little bit different! I have lunch at Le Boulanger. Being conscious about what choices I will have to make, I bring along a packet of fat free salad dressing. I buy these packets either on Amazon or Minimus.biz and always carry one when I want to avoid fatty salad dressing. 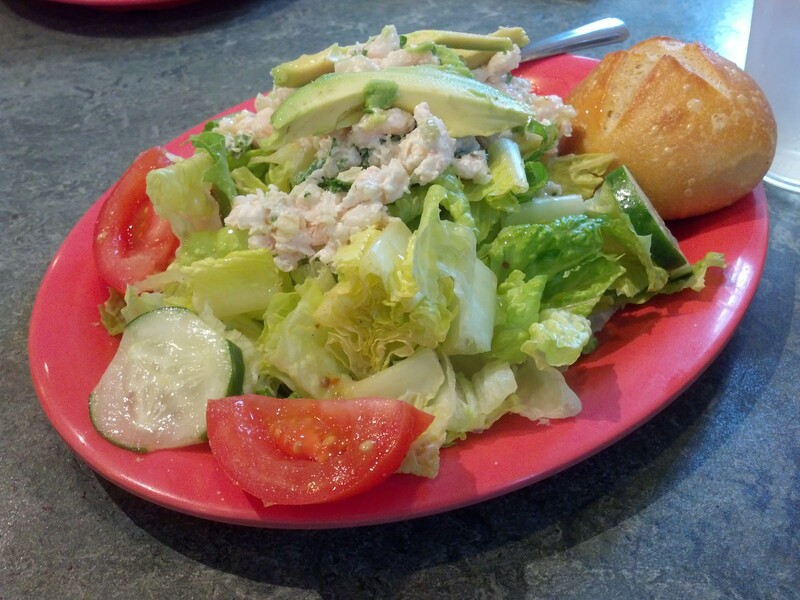 I order a salad with shrimp and a roll. Unfortunately the shrimp is in some mayonnaise but it is not too heavy and there is not too much shrimp. So I eat my salad with my fat free dressing and I eat part of the roll. It turns out to be a pretty sound selection for lunch. It takes me quite a while to eat and is filling. Our commute home is terrible and what should take about 50 minutes turns into an hour and a half. I am so glad that I did not plan to make some elaborate dinner. We unwind with a little popcorn and then fix our dinners separately. I have two eggs over-easy on unbuttered low-calorie, high-fiber bread and a snausage (soy pattie.) Since it is dinner, I permit my self two eggs, a luxury! The oozing yolk seems decadent after a week of very little fat. Yum, I love my breakfast for dinner! This entry was posted in Vegetarian and tagged breakfast for dinner, diet, Eggs, fat free salad dressing in packets, Le Boulanger bay shrimp salad. Bookmark the permalink.